Growing up in an urban environment in a difficult household, Element founder Johnny Schillereff discovered comfort in the artistic expression of skateboarding and other street culture. Emerging as a successful skateboarder and artist, he found himself bombarded with branded items and gear. He intuitively sensed that if he were to have a company, he would treat the branding a little differently. He received all this stuff, but what did it mean? What were they trying to say and who were the people saying it? 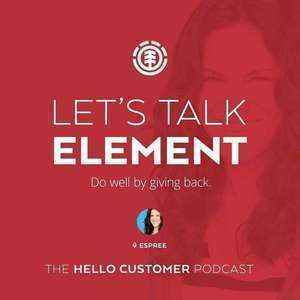 With that foundation, he built Element as a brand not just to sell products, but to spread a new spirit and lead a youth movement of positivity and accepting that the “impossible” can be overcome. With mega success, the down-to-earth founder still maintains that it’s the in-person conversation, the “human touch,” that gives him fuel to continue to work hard for the business day after day and keeps consumers connected to the brand. Element has a major focus on youth improvement, both through Element skate camps and through contests run through nonprofit Elemental Awareness. Always connecting nature and street culture, “from kickflip to campfire,” the team introduces youth to nature in a way they might not have access to otherwise, and gives them a behind-the-scenes look at big dreams with tours of the Element headquarters. It’s not about big numbers or scaling fast, for this brand. The best business books for success, according to Schillereff? “The Alchemist” and “Way of the Peaceful Warrior.” Constantly strive to be a better person, and business will inevitably grow. New brands are typically a reflection of who the founder is or who they’d like to be. How can you send a message you’re proud of? Elementality = a way of thinking. Positive thinking, loving what you do, and surrounding yourself with people you love to spread that power and energy to others. Element start skate camps to combine the peace and zen of the outdoors with the peaceful self-expression of skateboarding. Elemental Awareness nonprofit introduces youth to nature and skateboarding as an outlet and success building. Other outlets for youth engagement: Make It Count contests that require canned food donations for entry, tours of the Element headquarters where kids get to see behind-the-scenes and meet and talk with staff. Everything — ink, logo, fabric — should send a message. Using the platform for good and sending a positive message to consumers through every piece of the product. Take the technology out of the experience with in-person drop-in visits to stores and consumers. Being at skate parks is a better consumer learning experience than any other stats.